We, obviously, think roller derby is awesome, and that if you try it, you’d most certainly love it! I always loved roller skating as a kid. Someone tagged me in a post about a Freshie intake and although I didn’t really have much of a clue what it was about, I thought it looked awesome so signed up! Loved skating as a teen. Had been looking for a local roller derby team after seeing it promoted on BBC breakfast’s sport highlights. Initially signed up for a taster in Inverness who shared the Helgin taster day so I signed up for that instead. 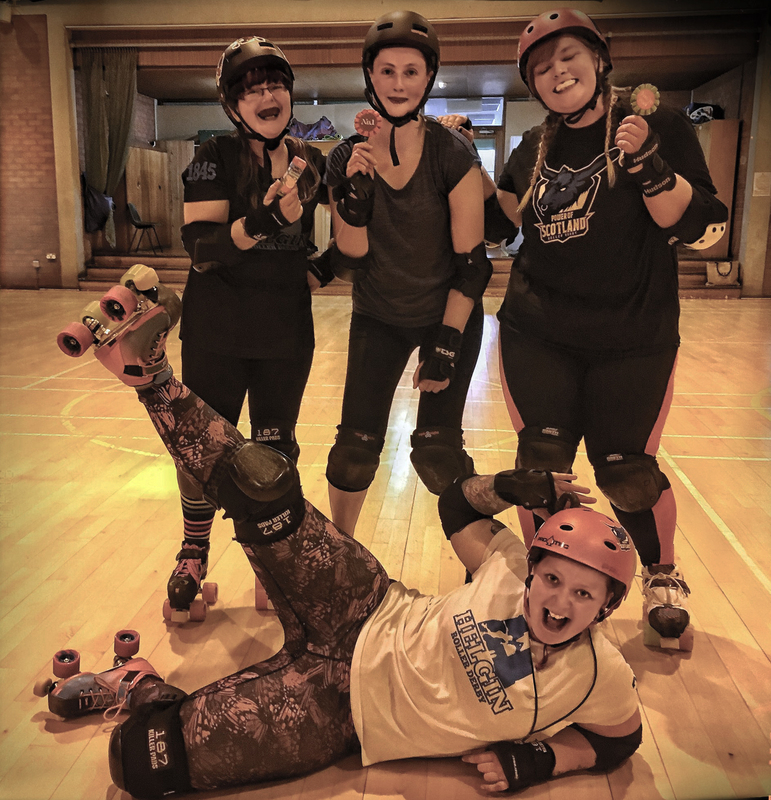 I needed a bit of fun and activity in my life, and perusing the various sports clubs in Moray nothing really caught my eye and excited me like roller derby did! It was something new and challenging, as I had never quad skated in my life – and I could see it would introduce me to a group of friendly, like-minded women; friends! Learning a new skill, being a tough female and making new friends. I really don’t need to look outside of the club to find a derby player to aspire to. Our coaches, Mane-iac and Shannibal Lecter, regularly display impressive skills during training – in addition to devoting their time to teaching in such a fun, friendly and patient manner! I’d love to be at a point where I can skate with similar comfort and ease – and also be able to pass on that know-how! Watching an advanced session, there was also a time when Melicious Intent flew past in ‘Side-Surfing’ mode; that awe-inspiring moment has stuck with me ever since! God do I want to do be able to do that! International- Missy Rascal. Local – Taz. Team – All are amazing but I love how Melicious Intent controls the track. Bruteyvicious is really confident and has some great skills! Stefanie Mainey! I wouldn’t say I really aspire to be like anyone though, I just want to be good enough to play one day! Turning up at the my first training session! I suffer from, sometimes crippling, social anxiety so turning up, on my own, and just taking part is probably my proudest moment. When I finally managed to glide on one foot – and round a corner! What has been your biggest derby challenge? 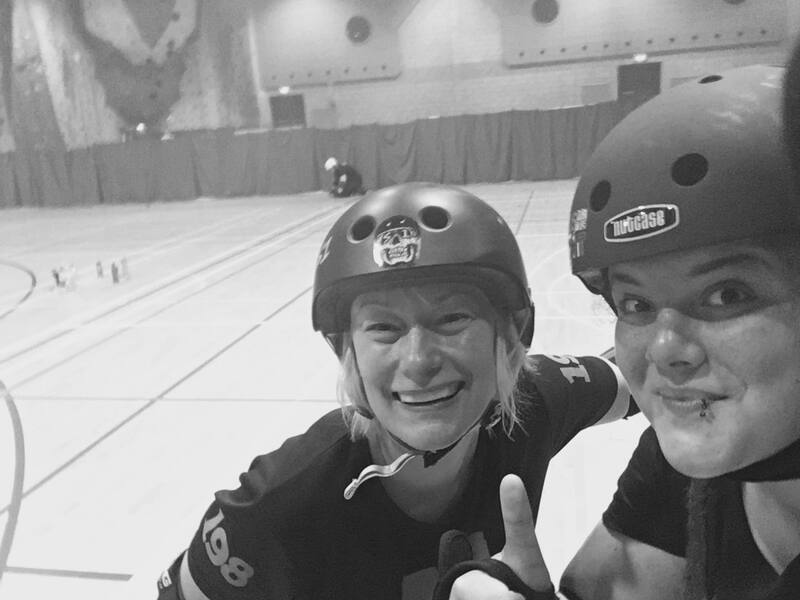 With social anxiety, attending the initial fresh-meat intake to give roller derby a go was a huge challenge for me – and one I wish I had overcome sooner! I’m finding it’s not only a sport that strengthens your body – but greatly benefits the mind as well. Self-doubt can easily become a barrier to progressing, but my team-mates have always been there to offer help and encouragement, and as such I’ve found my confidence and self-esteem slowly growing with my skills. It’s instilling a can-do attitude. Getting over the fear! Fear of falling, fear of going fast, fear of transitions, fear of contact! It’s an ongoing challenge, but one I’m slowly overcoming! Breaking through mental blocks, and crossovers. What do you most look forward to, moving forward in your derby career? Playing a game before I’m 50, which isn’t too long away! Passing my mins and getting to play! Being strong, stable and confident on my skates and being able to compete with the big gals! Passing all my minimum skills. That will be a huge achievement, as none of it has been easy or has come natural to me… I can’t wait to reward myself with a top emblazoned with my derby name! What is your aim/ goal for the next month at training? Perfect T-glides and do more toestop work. Nailing knee taps and making progress on my transitions! I’m currently determined to master my cross-overs, so that I can build up a bit of speed around the track during laps. To be able to hit the required lap-times would put a big grin on my face! 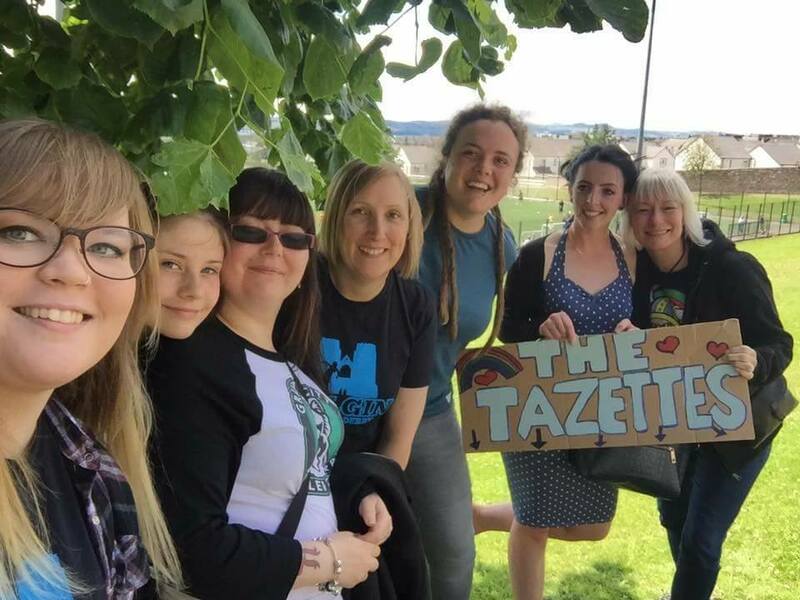 Tyrannosaurus-Bex, Raven Lunatic (and Jr), Kathital Punishment, Rachel, Bruteyvicious and Mad Minx cheering on Taz. What would you say to those thinking of starting roller derby? If you’re tempted then you must give it a go! The team are friendly and welcoming, and I’m kicking myself for not signing up sooner. You’ll start with others at a similar level, so you’ll not be alone! It’s amazing. I couldn’t be without Roller Derby now. Once you understand the game it’s not as scary as it looks. It’s empowering to be part of the Roller Derby community. It is a unique sport with challenges like no other! The only way to know what it’s truly like, is to just do it! Just do it! Don’t let fear of the unknown put you off! Strength, passion. Something just for me. I now enjoy and look forward to my weekends! It’s worth knowing the team organise loads of other fun activities too. Quiz nights, Raft races, Trampolining – to name just a few!